Today, I have more than 30 friends pursuing an MBA at various top universities across the planet. We communicate regularly and tell each other stories of our incredible experiences in the first few weeks of our MBA journeys. Stories and photos of careers events with top institutions, inspiring classes and wild parties flood my phone daily. For many people, these are just some of the reasons they chose to pursue an MBA. Everyone has a different reason for pursuing an MBA, and for choosing which university or school they go to. This much is clear from the very first day I arrived in Cambridge and met my Cambridge MBA classmates. Indeed, “Why did you choose Cambridge?” is the most common question I encounter when talking to people. My response is consistent: University of Cambridge Judge Business School, despite being only 25 years old (for comparison, Harvard Business School is 107 years old), has firmly and rapidly established itself as one of the world’s top business schools. I can go on and on, but this is not the reason why I’m writing this. Rather, I’m writing this to ask an often-overlooked, but more important question to my Cambridge MBA classmates. That question is, “Why did Cambridge choose you?”. That’s right. Why would a legendary 800-year-old institution, named by many as one of the world’s greatest and most eminent universities, that has given the world knowledge and discovery of gravity and DNA, choose YOU to study at its young business school? My answer to this question is, of course, personal and subjective. For me, a Cambridge MBA is a responsibility. As a scholar fully-funded by the Indonesian government, I am responsible for returning to my home country and I hope bringing it into its long-awaited golden age. While as a Cambridge graduate, I am responsible in shaping the world’s future, as many Cambridge graduates have throughout history. I believe that Cambridge chose us because Cambridge believe that we are capable of bearing the responsibility to continue the university’s legacy of innovation, discovery and global impact, shape it anew, and then carry it to businesses, governments, non-profits, or wherever we will choose to be in the future. 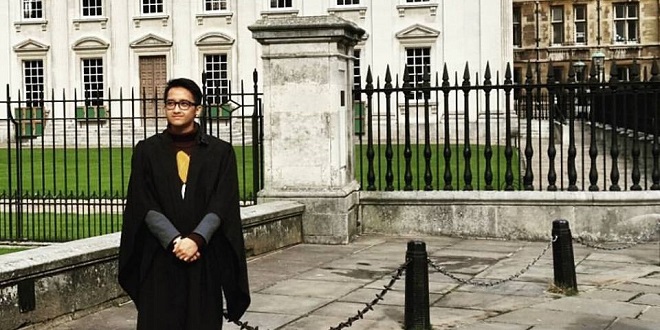 It is also for this very reason that I chose to go to Cambridge: I believe that here, I will get so much more out of my MBA than just career progression. Now, living up to the legacy of our most famous alumni such as Isaac Newton, Charles Darwin, and Stephen Hawking might sound impossible, and it very well might be, but consider this: some of Cambridge’s most significant contributions to humanity were made long after the university was established; it was roughly 480 years old in Newton’s era, it was 636 years old in Darwin’s era, and indeed, was 781 years old when Hawking rose to prominence! And consider this: Cambridge’s Judge Business School is only 25 years old, and yet it has graduated people who are now clearly on their way to making significant contributions to the world. Badr Jafar, who chairs Crescent Group, is working with the United Nations to foster good governance and transparency in the Middle East. Eben Upton, founder of the Raspberry Pi Foundation, is working to introduce computer science early to millions of young people in the developing world. Still, a lot more work needs to be done, and I’m not saying that we have lived up to the legacy. But with one eye on the history of Cambridge and one on the impact of the rapidly changing business school, I expect great things from my myself and classmates.